Sometimes, we take things for granted until it is in danger of being taken away. This was exactly what I felt when I found out that one of my all time favorite restaurants, Je Suis Gourmand was going to close its doors come December 31, 2010. According to head chef and resident culinary genius Marc Aubry, the restaurant was not doing as well as it should in different areas. The partners thus decided to shut down completely. When I heard this news my first thought was that I need to go back a couple of more times to enjoy my favorite dishes while I still can. 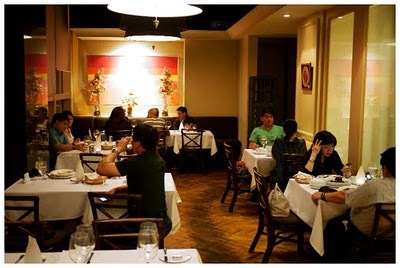 Apparently, as word spread around town, many others also shared my same sentiment and started to flock back to Je Suis Gourmand creating a sort of renaissance if you will, with the restaurant enjoying brisk business in the past weeks. For my last meal at Je Suis Gourmand, my original plan was to go on a date with my daughter N. However, my good buddy T after hearing of my plans, asked to tag along. I could not refuse him specially after he promised to bring a bottle of wine from the Margaux region for us to have with our meal. Chef Marc graciously prepared a simple Carbonara for my daughter while I decided to have some of my old favorites. I decided on having two starters and one main course. A little bit too much food even for me, but what the heck, I consider this meal a special occasion anyway. First off, I asked Chef Marc to make me a Steak Tartare(P520). This dish is not on the menu, but you may order it a day in advance. 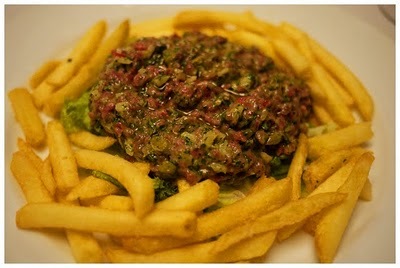 Steak Tartare is one of my favorite dishes. There is nothing like having a perfectly seasoned portion of chilled minced raw meat mixed with egg yolks, onions, and capers. Je Suis Gourmand’s version does not disappoint as the meat was of great quality and had the perfect lean/fat ratio. I highly recommend this to all Steak Tartare lovers out there. Very, very sarap! 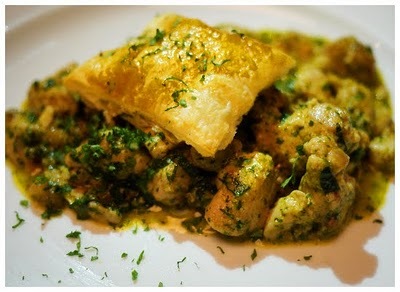 A Sauteed Veal Sweetbread in Herby Tomato and Garlic Sauce with Puff Pastry (P450) came next. Sweetbread is another name for the pancreas or sometimes other glands as well. From what I have read, it is usually soaked in milk for a couple of days and then fried or sauteed. Its consistency is similar to ox or goat’s brain. Again, this was very tasty and definitely worth trying. If there is one thing that I most admire about Chef Marc is that he is a master at making the most delicious sauces. This was evident when I was served my Roasted Duck Breast with Dauphine Potatoes in a Fresh Mushroom Sauce. Apart from some fresh mushrooms, the sauce also had lots of finely grated fresh herbs in it. 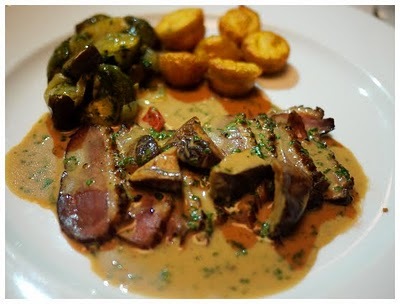 It was spot on and complemented the slices of duck breast to a point where I could only sigh in contentment. After all that food, dessert seemed out of the question. So I decided to cap off the evening with a double espresso and some good conversation with my lovely daughter and T of course. Chef Marc has kept mum about his future plans but word on the grapevine is that he will venture out on his own very soon. I heard that he is working on opening his own place in hopefully, the same location as where Je Suis Gourmand is now. Target opening date is March or April 2011. I hope this plan pushes through as I already miss his cooking. I would like to greet all our readers a very Happy Christmas and a Prosperous New Year! Your continuous support has been the best gift. Please keep reading! There's still hope. Chef Marc plans to open his own place in a few months. Would you know how to may I contact Chef Marc, an email address would do. We love his products sa Gourmand, especially the foie gras, we'd just like to contact him with regards to that. Thank you in advance. Please send me an email at mail@shalimarsportsintl.com and I will give you Marc's contact details. Is it possible if you could also give me Chef Marc's contact info? My boyfriend and I have always loved Je Suis Gourmand and we're excited to know more about this new restaurant that he's planning to open. My boyfriend is also a chef and wants to learn from Chef Aubry. Iris please email me at mail@shalimarsportsintl.com.